Tullamore Rugby Club Tour are travelling to Spain on Wednesday the 25th of May 2016. 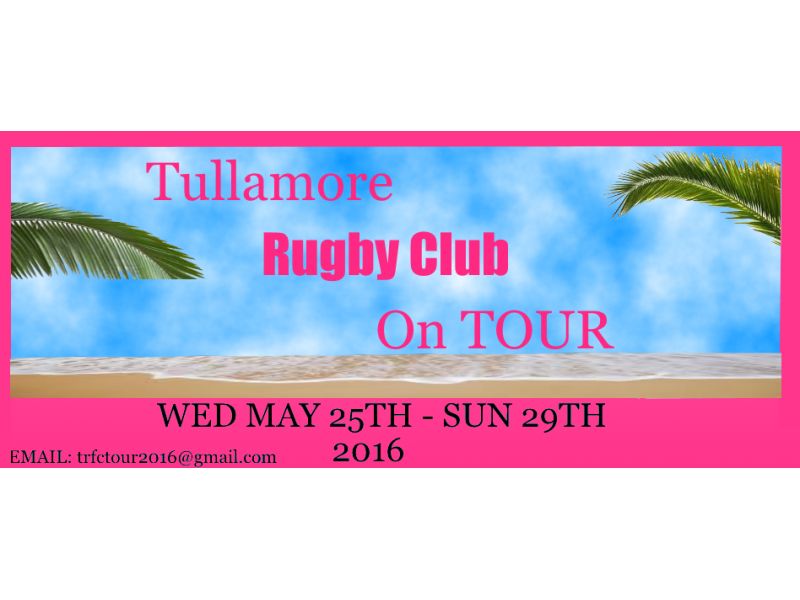 This is an official Club Tour and is open to all adult members of the Tullamore Rugby Club above the age of 19. This trip is open to all players both female and male, coaches, management, officials of underage and senior squads and all non playing members. We will break up our group into three different parties regarding accommodation. The Male players shall have their own complex.The Women will have their complex on the opposite side of town and the non playing members shall have a nice peaceful complex of their own. If you choose to share an apartment with some of your friends contact us and we can cater for this but please do so asap. As this is an official tour we will be playing a rugby game to be held on the Friday night and followed by a BBQ. We have provided transport to and from this event which shall depart and return you to base at 10.30 leaving you to enjoy the evening as you wish. On the Thursday we have been invited to a evening meal in a local bar at 8.00pm. We will designate Thursday as our activities day... so if you wish to suggest an activity contact us by email. Our package... Bus to and from Dublin airport. All deposits and monies collected shall be held William Farrell Hon Treasurer of the Tullamore Rugby Club. If you wish to contact us you may do so by email we can assure you all shall be respected in confidentiality. So if you are interested in going contact us by e-mail only at trfctour2016@gmail.com as soon as possible. Eddie Brady and Derek Woodnutt, Joint Organisers.